Burgas airport - 10 km. Burgas Bus station - 3 km. Burgas Railway Station - 3 m.
Burgas to Sea Garden - 1,5 km. Burgas to town centre - 1 km. Accommodation: The hotel offers 72 double rooms, 6 single rooms, 7 family rooms, 6 rooms for disabled guests, 5 studios and one 1 presidential apartment. - modern SPA centre with a pool. Bars & Restaurants: The Restaurant - Bar offers a variety of seafood dishes and vegetarian delicacies as well as an assortment of high quality drinks are served in exquisite atmosphere and comfort. The restaurant offers 90 seats. Meeting Facilities: The three conference halls of the hotel - the NEPTUN, NIMFA and AQUA halls have a capacity varying from 30 to 150 seats. The halls are an excellent choice for the organizing and holding of business meetings, seminars, conferences, corporative activities, presentations, training and business cocktail parties. The conference halls offer all modern equipment and communication facilities necessary for the successful implementation of such activities. 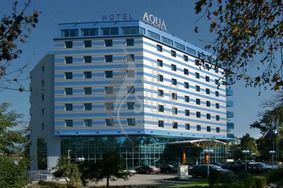 Health & Beauty: The Aqua Hotel in the city of Bourgas also disposes of one of the most modernly equipped Sports and Rehabilitation centers in town. The Center includes an indoor swimming pool, Jacuzzi, saunas and steam baths, a fitness hall, a massage room, a solarium and a hair dresser’s. Access to the Sports and Rehabilitation Center have all of the guests of the hotel as well as all other visitors. The swimming pool of the hotel is quite unique. It is the only pool in the city of Bourgas that has underwater draft and offers opportunities for taking of underwater pictures.